Formulate your question to the Yijing (formerly we wrote: I Ching, but the pronunciation remains the same) in the text input box above. This question and the answer given by the Yijing can only be read by you. 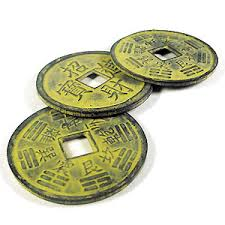 The answer from the Yijing appears by clicking the Answer button or on the coins. You see two hexagrams emerge. The left hexagram, the cast hexagram, tells about the situation you are in, about how things are now, the right hexagram, the relating hexagram, tells about which steps you can take to restore or strengthen the harmony. 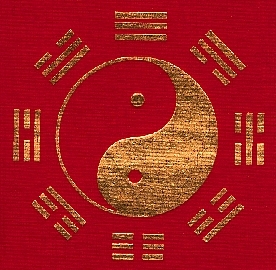 If none of the lines move, there is no relating hexagram, and then you see an image of the Duke of Zhou, who urges you to study the Judgment. 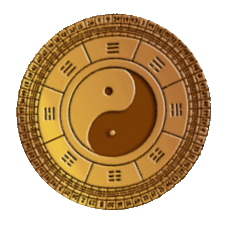 By clicking in the hexagram on the buttons 'the Character', 'the Judgment' or 'the Image' the Yijing gives the individual applicable comments. You can also read these comments by scrolling through the hexagram The moving lines of the beginning hexagram are displayed below the two hexagrams. If no line moves, then you read the Judgment. All separate red lines in the hexagrams can be clicked separately. The red lines are therefore also buttons. Their meaning appears in a new smaller window, which you can close again. It is possible to ask a new question by clicking on the coins or by selecting 'ask a question' from the menu at the top of the page . This site gives you the possibility to take an account. You can then save your questions and answers and read them later. An account costs $12 yearly. It is of value to reread later what the Yijing replied to your question. You read the answer differently and it is a good way to learn to understand symbolic language of the Yijing better. A detailed explanation and a user manual on the Yijing can be found in the foreword by C.G. Jung and in the introduction of the translator of this text, R. Wilhelm. This introduction also explains more about how to ask a question to the Yijing. The historical Chinese explanation, with commentary from R. Wilhelm, about the Yijing can be read in the Ten Wings. If you want to learn more about the backgrounds and the use of the Yijing, please visit the site of the Yijing Research Center. 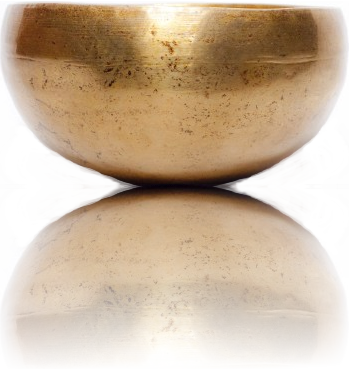 For those who want to concentrate on their question, an antique Tibetan singing bowl is shown at the bottom of this page. Click on the bowl for its sound. NB. This site is regularly updated and improved. That job is not finished yet. If you as a user have suggestions or comments, would you like to let them know? You can mail your comments via this link. All reactions are highly appreciated.